Jesus entered the city of Jerusalem on the 10th day of the month (Palm Sunday). On the 14th (Maundy Thursday) the disciples prepared to eat the Passover. That evening after sundown (the 15th by Jewish figuring) Jesus and the disciples ate the Passover. As the next day came Jesus went to the cross. Both the eating on Thursday evening and the events of Good Friday would be the 15th of the month, the day of Passover. So Jesus is our Passover Lamb. And like the Passover Lamb in Exodus His blood marks our door and protects us from death and hell. We read how Jesus washed the feet of His disciples. He took the place of a servant, and cared for them. He said, “I am among you as one who serves.”(Luke 22:27) In the same way He serves us, meeting every spiritual need and hearing every prayer. As we commune together we come to a meal where Jesus serves. He invites us to His table, and comes to serve us. Then Jesus calls us to serve one another and care for each other. Jesus showed care and love even for the disciple who would betray Him. It is a custom that the host of the Passover meal makes, dips, and gives a special morsel to one of the guests that he wants to show special favor and friendship to. When Jesus gave “the sop” to Judas He was telling Judas of the love of God. To a Christian this verse obviously refers to Jesus. The Rabbis insisted on this because of the prophecy – without knowing why. The Afikomen became a part of the Passover celebration before New Testament times. What happened was that three pieces of the Passover Bread (Matzahs) were placed in a fabric container before the meal. During the meal the middle one was taken out, wrapped in a special cloth and hidden somewhere. Later in the meal the children were to search for the hidden bread, the Afikomen. When they found it they brought it out and everyone celebrated. Then it was broken and shared with everyone there. The practice looks an awful lot like a picture, acting out how Jesus, the Second Person of the Trinity, was hidden in the tomb for three days, wrapped in the burial cloth, was searched for by the disciples, and when they saw Him risen on Easter they celebrated. Paul identifies the cup of Blessing as the one Jesus used to institute the Lord’s Supper. We could say that we are still at that point in the Passover, and the meal continues on. It is a part of Jewish tradition at the time of the 4th cup to have a child look outside to see if Elijah is coming. The coming of Elijah is an end of the world event. He will be coming back with Jesus. So the Supper points to the end of the world and will continue on until the end. Jesus said, “I tell you I will not drink again of this fruit of the vine until that day when I drink it new with you in My Father’s kingdom.”(Matthew 26:29) We wait for the fulfilling of the promises and the completion of the meal, when Jesus returns. This is a verse taken from the ends of two sections of the Psalms known as the Greater Hallel (Psalms 119-136) and Lesser Hallel (Psalms 113-118). Those were psalms used for the Passover meal and were to be sung. So when Matthew and Mark report “When they had sung a hymn they went out to the Mount of Olives” this is what they were doing. The last thing Jesus and the disciples did before going out was to finish the singing of the Hallel. Psalm 118 begins and ends with the verse, “O give thanks unto the Lord, for He is good; and His mercy endureth forever.” Psalm 136 begins with that verse and continues with each verse ending “His mercy endureth forever.” When we sing this verse, we are remembering how Jesus went from the Lord’s Supper to Gethsemane and then to the cross. Part of the Passover meal went on after the eating was all done. Those gathered would share the words and promises of God from the Old Testament. The Gospel of John records long discussions between Jesus and the disciples. John 13:31-14:31 was part of that discussion – apparently this part happened in the Upper Room. It ends with Jesus saying that it was time to leave the room where they had eaten the Passover. As Jesus went out with His disciples they continued to talk about the Words and promises of God. Read John 15-17 to discover what they may have discussed as they walked along. And then read Jesus’ great High Priestly Prayer for us in John 17. It is a part of the Passover tradition that the meal is not finished until the last person falls asleep. Talking about God and about faith can continue all night and into the next day. It is still counted as being part of the supper. When Jesus and His disciples went out to the Garden of Gethsemane and the disciples fell asleep, but it was still part of the Passover because Jesus had not. So the Passover continued on into the next day, all the way through Jesus’ arrest; through the trials before the Sanhedron, Pilate, Herod, and Pilate again. It continued through the scourging; through carrying the cross to Calvary; through Jesus suffering on the cross; and on until Jesus said, “It is finished,” and “Father into Your hands I commend My spirit.” Then He bowed His head and gave up His spirit and the Passover was complete. From the beginning of the meal until the end of the crucifixion it is all one event – the Passover of Jesus, the Lamb of God who takes away the sin of the world. I wrote this during Christmas season a few years ago. I thought I would share it again.. Merry Christmas. He is God with us. 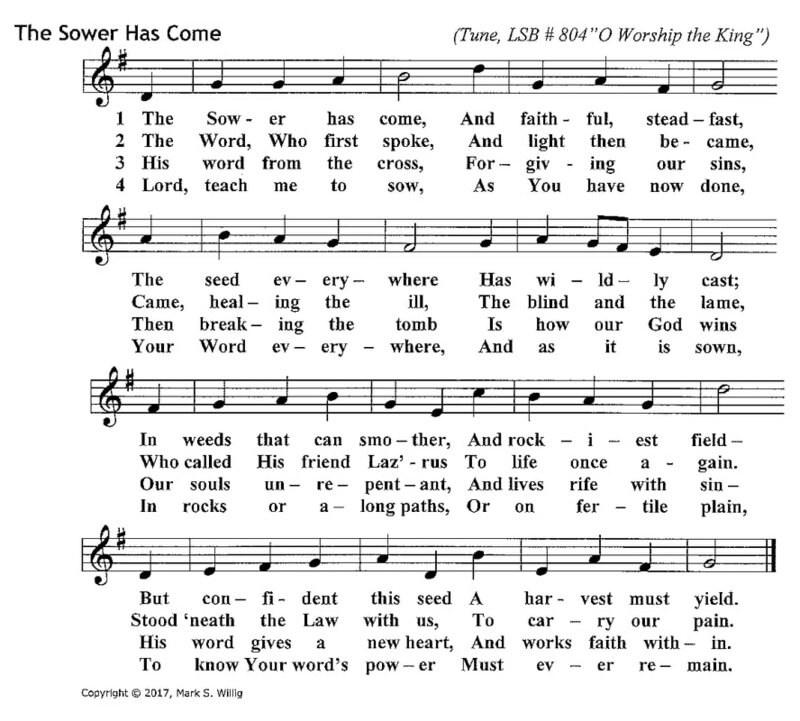 This hymn was written for Sunday, August 20th. Verse 4 was adapted from "A Lamb Alone Bears Willingly". 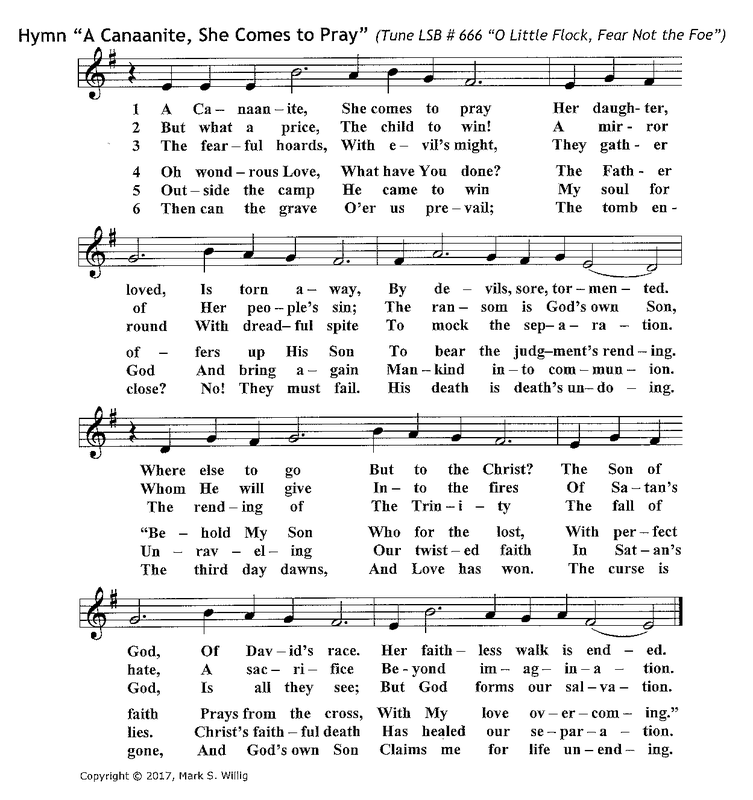 Feel free to use this hymn. 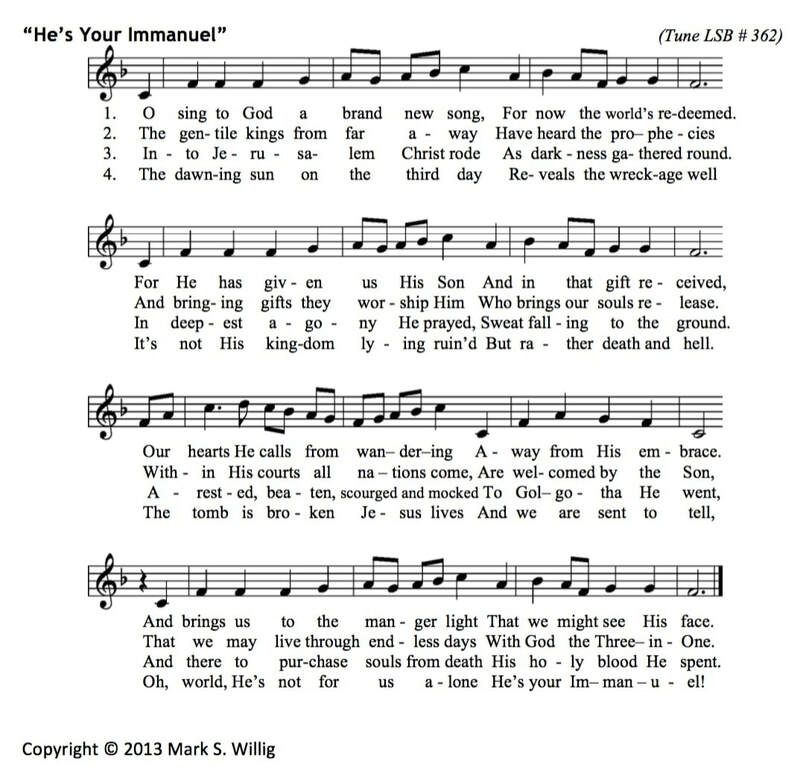 This is a new hymn, written for the Gospel lesson this Sunday. Feel Free to copy and share. It is not that we are committed to an idea; or that we have bought into certain principles by which we will live our lives. It is much more that we are talking about. Many around the world will say that they follow the teachings of _______ (fill in the blank: Marx, Confucius, Thomas Jefferson, Martin Luther, and others). But they do not talk about a personal relationship with them, or talk to them. What would happen if I visited the tomb of Abraham Lincoln in Springfield, Illinois and claimed to be having a conversation with him? I would stand a pretty good chance of having the guards take me by the arms and lead me away. The whole world knows that anyone who claims to talk with Abraham Lincoln and thinks he answers is not fully sane. We say prayer is talking with Jesus. The rest of the world may look at us as odd and old fashioned, religious fanatics and out of touch. But they do not try to tell us that it's "just as insane" as talking with Napoleon. 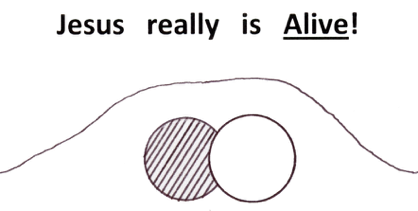 The claim that Jesus is alive is so powerful a claim and it is right at the heart of what it means to be a Christian. Even the world around us has backed off and ridicules prayer for other reasons. There were the daily sacrifices, the sacrifice of the Lamb at Passover (see Exodus 12), the Scapegoat (on whom the sins of the nation were placed and who then was driven out of the camp – so the Bible says Jesus had to go outside the city to be crucified), and many more. All these sacrifices point to Jesus. They tell us how Jesus Christ has taken every kind of our sins on Himself and died in our place. The Shepherds were out in the fields watching their flocks by night. Read Genesis 35:19-20. It tells how Rachel died "and was buried on the way to Ephrath (that is, Bethlehem)" and how Jacob went on and "pitched his tent beyond the tower of Eder." Then read Jeremiah 31:15-16. It tells about "Rachel weeping for her children". It is at Ramah that the people of Judah were gathered, chained and roped together, and led off to exile in Babylon. But verse 16 says, "Keep your voice from weeping . . . they shall come back from the land of the enemy." Putting those two passages together (1) God gives hope for the mothers of Bethlehem whose children were killed by Herod -- "they shall come back." But also (2) the Rabbis expected that the first announcement of the coming Messiah would be at "Migdol Eder;" the "tower of Eder." Eder means flock (as in flock of sheep), so "Migdol Eder" means "Tower of the Flock." Look up Luke 2:8-11 and see if they were right. Why were the shepherds out in the fields at night? Most sheep are brought into the sheepfold where they are safer. But Bethlehem is close to Jerusalem. Sheep that were destined to be sacrificial sheep at the Temple had to be kept outside, in nature not in buildings all the time. Shepherds built towers to more easily watch their sheep. So the angels went to shepherds watching over sacrificial sheep to tell them about the One Lamb, the Lamb of God who takes away the sin of the world. This is amazingly appropriate, isn't it? According to Rabbinic tradition the name of the Messiah was concealed from eternity, to be revealed only when the time was right. So the revealing of the name was tremendously important. A lot of details about Jesus are already told in the Old Testament – where He would be born, when He would be born, which tribe of Israel He would be from, etc. – but not His name. The name Jesus was independently revealed to both Mary and Joseph. If you read through Isaiah 7:14 you would expect His name to be Immanuel. But . . . first the angel appeared to Mary and told her she would bear the Savior of the world and told her to call Him Jesus. Then Joseph found out that she was pregnant and did not believe her. Only then did an angel appear to him in a dream and tell him to call the baby Jesus. The name "Jesus" was revealed to both Mary and Joseph, to each one of them independently. This is one example of God’s Word being corroborated by matching dreams, visions, or revelations. (See also Paul & Ananias in Acts 9 and Peter & Cornelius in Acts 10.) This is important in confirming Mary's truthfulness and that the dream Joseph had really was from God. God the Father is the "Fountainhead" of the Trinity. God the Son, Jesus Christ, is begotten of the Father and the Holy Spirit proceeds from Father and Son. There never was a time when the Father was alone. Jesus Christ, God the Son, is eternally begotten; and the Holy Spirit is eternally proceeding. It is part of the character of God the Father – this rejoicing in bringing forth life. 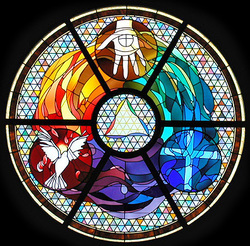 There is celebration within the Trinity. Proverbs 8:22-31 talks about Wisdom sharing in the work of creation. Wisdom in this passage is very likely a word for the Second Person of the Trinity, God the Son. In vv. 30-31 Wisdom says, "then I was beside Him, like a master workman, and I was daily filled with delight, rejoicing before Him always, rejoicing in His inhabited world and delighting in the children of man." By the way, the Hebrew word for "rejoicing" is also used for celebrating, playing, gamboling (what lambs do when they jump and run around the pasture), and dancing. There is a song titled "Lord of the Dance," that starts out, "I danced in the morning when the world was begun . . ." and then goes on to tell the story of salvation. The angels were created; and once they are created they also join in the celebration! In Job 38:4-7 God asks Job, "Where were you when I laid the foundation of the world? . . . when the morning stars sang together and all the sons of God shouted for joy?" How did the disciples respond to Jesus' resurrection? They did not accept the truth easily. In fact their response and experience fits into the fourfold pattern of: Denial; Hearing; Encounter; and Confessing & Proclaiming. (1) Denial– at first every one of them denied that Jesus could possibly be risen. (2) Hearing (The Message was Proclaimed to them) – before they saw Jesus every one of His followers heard the message that He was risen; from angels or others who had already seen Him. But they still refused to believe. (3) Encounter with Jesus – only after hearing that Christ is Risen did they get to see Him. This is when the disciples finally believed Jesus was alive. (4) Confessing & Proclaiming – they confessed their faith in Jesus; and then began proclaiming, telling others that Jesus is risen.